'Filthy rich' get richer: Challenge the bosses' greed! Clive Heemskerk reports on developments around the recently launched Trade Unionist and Socialist Coalition. THE DECISION to establish the Trade Unionist and Socialist Coalition (TUSC) has been widely welcomed by many fighting trade unionists. Three regional councils of the Rail, Maritime and Transport workers union (RMT) have declared in support of an election challenge. Applications are going in to the union's national executive from RMT branches for authorisation to back local candidates. The RMT executive has made its first such endorsement, for the contest in Carlisle. Last week's meeting of the TUSC steering committee agreed the first 24 coalition candidates, including the former RMT executive member Mick Tosh, standing in Portsmouth North, and Keith Gibson, a leader of last year's Lindsey Oil Refinery construction workers' unofficial strike committee, challenging cabinet member Alan Johnson in Hull West. Other candidates endorsed include the Socialist Party councillor and former Labour MP Dave Nellist, standing against Defence Secretary Bob Ainsworth in Coventry North East, and a former Labour parliamentary candidate, Dave Hill, in Brighton Kemptown. Last week also saw a meeting to establish a TUSC steering committee for Scotland (see report). Drawing in representatives from the regional council of the Fire Brigades Union, and branch officers from the RMT, the Communication Workers Union, the PCS civil servants' union and the largest Unison branch in Scotland, it was a further indication of the potential of TUSC. The list of TUSC sponsors continues to grow, reflecting the enthusiasm of many workers that, at last, there is a prospect of a trade union rooted challenge to the 'savage cuts' pro-capitalist consensus of all the establishment parties. Many trade union leaders, however, still clinging to New Labour, don't see the situation in that way. This, of course, will have an effect amongst some rank and file trade unionists also, who are increasingly apprehensive about the likely outcome of the election. New Labour, beginning with chancellor Alistair Darling, has made it clear that massive attacks on workers' living standards, including draconian public spending cuts, are planned post-election. But then, looming in the background, is the spectre of a revived and even more vicious Thatcherism. The former Tory minister Michael Forsyth, a hated Scottish office minister during the battle against the poll tax, has called, for example, for annual cuts of £75 billion under a new Tory government. Surely in this situation, the argument goes, trade unionists should back the 'lesser evil'? This, at bottom, was undoubtedly the key consideration behind the decision made by the Communist Party of Britain (CPB) at its January executive committee meeting not to participate in TUSC. As one of the core organisations of the 'No2EU-Yes to Democracy' European election coalition, from which the discussions to establish TUSC developed, the CPB's decision is a disappointment. But more importantly, it offers no way forward for trade unionists on what can be done now - in this particular election - to begin to overcome the crisis of working class political representation. The Socialist Party believes that the Labour Party has now been totally transformed into New Labour, which bases itself completely on the brutal logic of capitalism. Previously, as a 'capitalist workers' party' (a party with pro-capitalist leaders but with democratic structures that allowed the working class to fight for its interests), the Labour Party always had the potential to act at least as a check on the capitalists. The consequences of radicalising the Labour Party's working class base was always a factor the ruling class had to take into account. Now the situation is completely different. Without the re-establishment of at least the basis of independent working class political representation, the capitalists will feel less constrained in imposing their austerity policies. TUSC will not fully provide the necessary alternative but it is still an important step forward. Above all, by drawing in the most combative sections of the working class in defence of jobs, public services and workers' rights, it can help to prepare the necessary forces to take forward the argument for a new political vehicle for workers in the post-election period. Not to do everything possible to help that process is a mistake. The Communist Party's decision was also shaped, they argue, by the fact that to date there is no official national trade union participation in TUSC. This is in contrast to the No2EU campaign, which was officially endorsed by the RMT. The TUSC steering committee includes, all in a personal capacity, the RMT general secretary Bob Crow, the general secretary of the Prison Officers Association, Brian Caton, the PCS assistant general secretary, Chris Baugh, and PCS vice president, John McInally. But the argument has been made that, nevertheless, TUSC is a step back from No2EU. The lack of formal endorsement of the coalition from even left-wing trade unions like the RMT and the POA reflects a concern that more time was required to convince the broader membership of the need to take such an important step. But it is wrong to say that TUSC is a step back from No2EU. The RMT's backing of No2EU was significant, the first national challenge to New Labour by a trade union since Labour's formation. The European elections, however, are not viewed as being as important as a general election is, not least by opponents of the union leadership within the RMT. TUSC has attracted support from many RMT members but has also sharpened political debate in the union. No doubt New Labour apparatchiks are looking on for any opportunity there may be to undermine a militant trade union leadership, in the same way they aided the Blairite candidate who unseated the left wing general secretary of the Aslef train drivers' union in 2003. In this context, the enthusiastic participation in TUSC in a personal capacity by leading trade unionists - in the RMT and other unions also - is highly significant. It is a clear signal that 'non-political' trade unionism will increasingly be seen as 'not an option' when the axe men are coming. A new mass political vehicle for workers, a new workers' party which could fill the present vacuum, will not necessarily develop through the official structures of the unions. It is certainly unlikely that a majority of the larger unions, at least nationally, would initially embrace a new party - in the same way that the biggest unions remained wedded to the Liberal Party in the early days of the Labour Representation Committee (the forerunner of the Labour Party). But big events loom, as the next phase of 'the great recession' unfolds, which will relentlessly pose before trade unionists in struggle that there must be an alternative. TUSC can play a critical role in developing this consciousness. 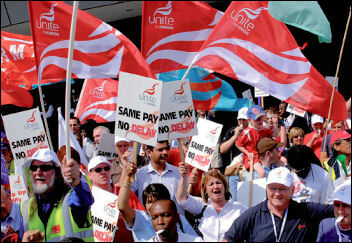 Trade unions are still the basic organisations of the working class, which gives them enormous social weight. It is not for nothing, for example during the British Airways dispute or the postal workers' strikes, that the capitalist media routinely denigrate the unions as 'holding the public to ransom' or 'crippling the economy'. For long periods, it is true, the formal structures in some unions can atrophy, with limited participation by rank and file members, but even these unions still possess social reserves. For the Socialist Party the importance of TUSC lies above all in its potential as a catalyst in the trade unions, both in the structures and below, for the idea of working class political representation. It can also play a role in drawing together anti-cuts campaigns, environmental campaigners, anti-racist groups etc. It is, however, only secondarily a vehicle for developing 'left unity', in other words, of socialist organisations collaborating for specific goals, or 'left regroupment', the bringing together of different socialist groups into one organisation. This conception of the role of the coalition was not accepted, however, by the Alliance for Green Socialism (AGS), another of the No2EU core organisations, in the discussions prior to TUSC's formation. AGS representatives, for example, proposed that one criteria for a socialist organisation to be admitted onto the steering committee should be a membership of "at least 100", while opposing trade unions from having more than one representative (the RMT has 80,000 members). This proposal would have 'crowded out' the most important component of the coalition. The AGS's other concern was to include an environmental reference in the coalition's name, which was not accepted by the other participants. The Socialist Party insisted that the threat that capitalism poses to the planet must be reflected in the coalition's core policies. But when, as recent polls show, 59% of the population believe that the establishment politicians, all claiming the green mantle, are using climate change as a back-door way to raise taxes (The Guardian, 12 January), including 'green' or another environmental term in the name could be a potential barrier and not an aid to dialogue with broader layers. Unfortunately, despite an offer that the AGS could stand under their own name where they provided the coalition candidate but still have a place on the TUSC steering committee, they decided to withdraw. TUSC HAS been established as a federal 'umbrella' coalition, with an agreed core policy statement but with participating candidates and organisations accountable for their own campaigns. The steering committee welcomed the support of a number of socialist groups, including the Walsall-based Democratic Labour Party and its councillor, Peter Smith. Amongst the first tranche of TUSC candidates approved, are members of four different socialist organisations, including Socialist Resistance and the Socialist Workers Party (SWP). The admission of the SWP to the coalition was not automatic, however. TUSC is a federal coalition but each component, its candidates and participating organisations, will be scrutinised, certainly by New Labour opponents inside the trade unions. With this in mind the record of the SWP was questioned. Bob Crow, reflecting the response of RMT militants as last year's Lindsey strike unfolded, immediately and rightly condemned those "misrepresenting the strikers as xenophobic - a posh word for racist" (in a letter to The Guardian, 6 February 2009). The SWP, on the other hand, criticised the strikes as 'nationalist'. The SWP took a similar stance towards No2EU, the electoral body which was supported not just by the union tops but a big majority of RMT activists. These and other political mistakes by the SWP will not make winning support for TUSC easier inside the RMT, and other unions too. Moreover, there is also suspicion amongst many activists of the methods of the SWP when working in broad coalitions. The SWP rejected a federal approach in the Socialist Alliance, for example, using its weight of numbers to dominate, which compelled the Socialist Party to leave and led to the eventual demise of that organisation in 2003. On the other hand, it was argued, the SWP's record will not be known particularly to workers moving into struggle for the first time. They could be attracted to TUSC and would naturally want to see the widest possible unity. It is necessary not to do anything that could be a potential barrier to them. On balance then, it was felt that the potential drawbacks of the SWP's involvement could be overcome. So, after assurances that they would accept the federal character of TUSC, the SWP have been invited onto the coalition steering committee. THE FOUNDING of the Labour Representation Committee (LRC) in February 1900 was greeted by The Clarion, a popular socialist newspaper of the time, as "a little cloud, no bigger than a man's fist, which may grow into a United Labour Party". TUSC is certainly not a new LRC, which itself was not pre-ordained to develop into a mass party. It contested just 15 seats in the 1900 general election and affiliated union membership halved in its first year. But the capitalists' offensive then against the workers' movement, typified in the Taff Vale court decision to open up the railway workers' union funds for strike damages, compelled the unions onto the political plane. The period ahead will be no less turbulent than then, in fact more so. The Trade Unionist and Socialist Coalition is today just a modest step on the road to establishing independent working class political representation but its potential role, as it fills out or as a precursor to future developments, could be immense.